A- Ground floor: 358 msq, three formal receptions, One formal dining room with guest WC. One office with a private bathroom. 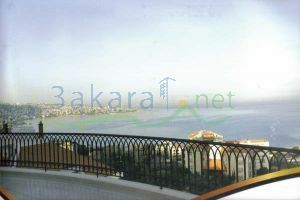 main Kitchen and a family breakfast area.. B- First floor: 343 msq, Royal suit: Bedrooms with three dressing and bathrooms. One family living with pantry and bathroom. C- Second floor: 397 msq, Royal suit: Bedroom with three dressing and bathrooms. One living, master bathroom and Jacuzzi. D- First Basement: 455 msq, One living room with a guest WC. Two guest bedrooms with bathroom. Maids bedrooms and bathrooms. Guard room. Parking. E- Second Basement: 213 msq, Multipurpose and recreation room with two bathrooms. 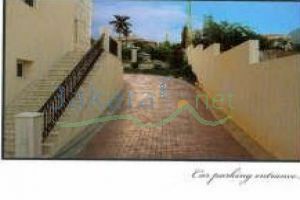 The ground floor: Is constituted of one main entrance thats faces a panormaic elevator from where a sea view is visible. 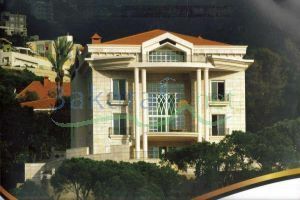 On the right side of the entrance, there is an ofiice with a lobby and three formal receptions, one with double volume that overlooks the Maameltain highway and Jounieh. On the left side of the main entrance, there is one dining room, one pantry family breakfast with guest toilets and a kitchen.